The Pharma company is a single product company. The company presents the following information regarding its activities during the month of December 2013. Dec. 01: Beginning inventory; 200 units @ $10 each. Dec. 02: Sold 160 units @ $16 each. Dec. 12: Purchased 300 units @ $12 each. Dec. 18: Sold 240 units @ $17.50 each. 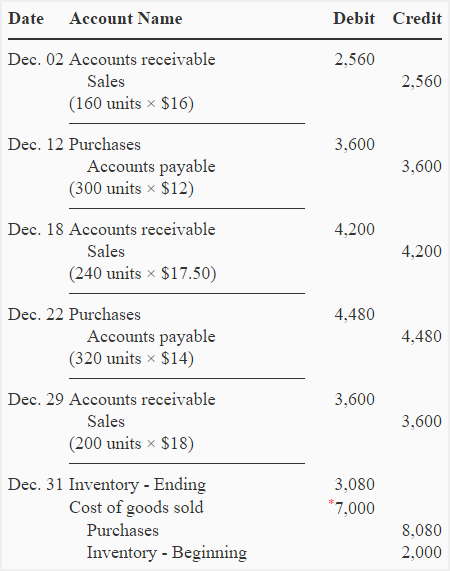 Dec. 22: Purchased 320 units @ $14 each. Dec. 29: Sold 200 units @ $18 each. At the end of December, there were 220 units on hand according to a physical count of inventory. Pharma company uses a first-in, first-out (FIFO) cost flow assumption. All purchases and sales are made on account. 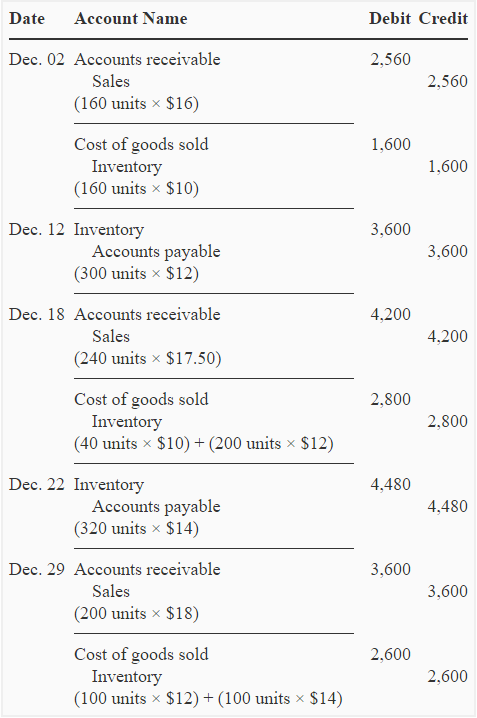 Prepare journal entries and compute gross profit assuming the company uses a periodic inventory system. Prepare journal entries and compute gross profit assuming the company uses a perpetual inventory system. Notice that cost of goods sold and gross profit of the Pharma company are same under both periodic and perpetual inventory methods. It is because of the use of FIFO cost flow assumption. Thank you limitless, it is strongly useful lesson. How useful and helpful the lessons are for accounting beginners ! Cheers!!!! 10Qs very much(a lot).It is encouragely helpful & useful. This is very useful! Best website like EVER!